I’m doing a bit of backtracking here, but feel the need to write about how we arrived at South Luangwa for our safari. 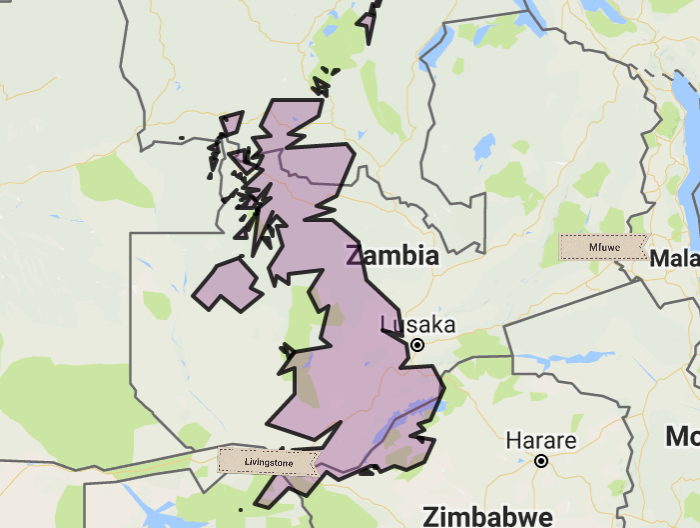 This involved getting across Zambia, which is a pretty big country. The quickest option from Livingstone to Mfuwe was to fly, which would take just under 3 hours and cost several hundred pounds each. We decided to take the bus. Or rather buses. In fact two buses over two days, with an overnight stay at Lusaka Backpackers. It was much cheaper (a total of about 36 pounds each), and offered an experience we certainly wouldn’t find by flying. Our first day was on the 7 AM Shalom bus from Livingstone to Lusaka. This was on mostly good roads, with several stops at service stations, and took 9 hours rather than the 7 advertised. The amount of luggage and goods taken on the bus was an eye opener. Boarding time is 30 minutes before set-off, but people arrive earlier, we realised, to get all their stuff on board. 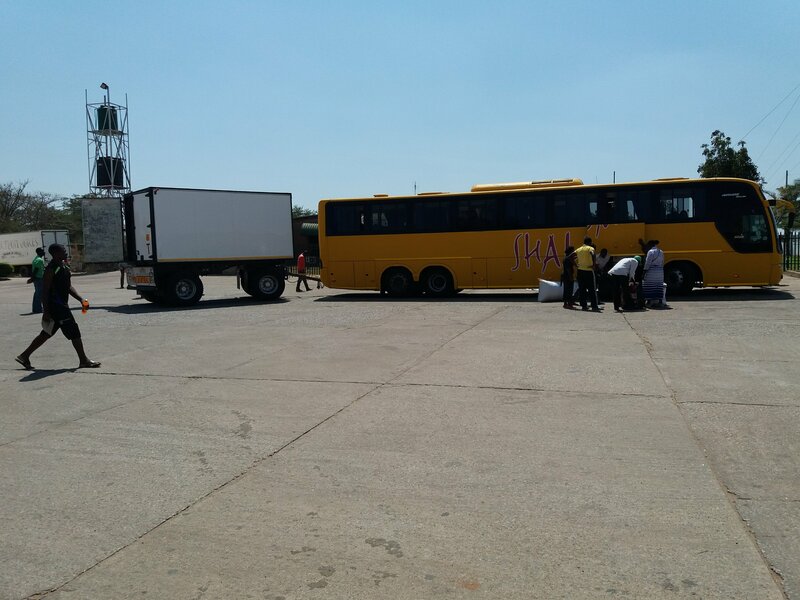 Our suitcases mingled in the hold with sacks of maize, bags of shoes and cooking pots, and the luggage racks on board were stuffed full of everyone’s worldly goods. And, just to make sure, the bus was towing a trailer. Goods were unloaded and loaded at each stop, and at one service station, we noticed a settee and chairs being stuffed into the trailer. Buses in Zambia are obviously for more than transporting people. The Lusaka traffic slowed us down, in fact it was gridlocked for a while, but on the way into the city the bus stopped to pick up a passenger who turned out to be a preacher. 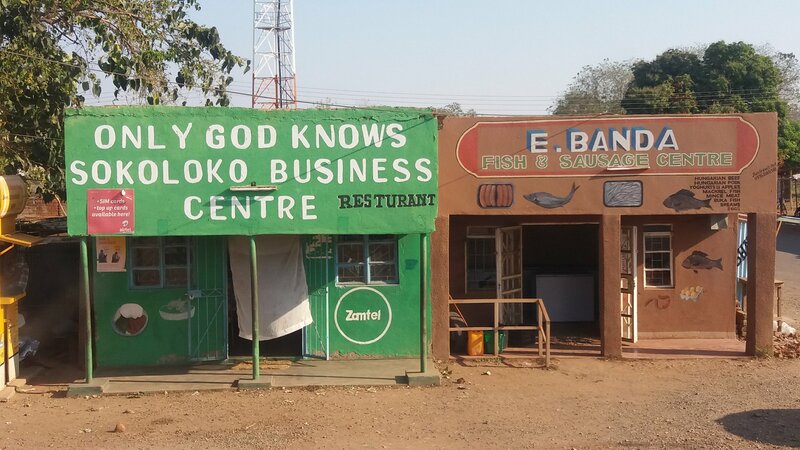 He walked up and down the aisle praising the lord, and asking everyone to pray with him, but even the Zambians were rather subdued with their amens. He ended up by playing his guitar to entertain us all. As he walked past us at Lusaka Bus Station to get off, he blessed me, calling me “mother” and said something like, “Praise be, you have reached the end of your journey”. I told him that we hadn’t as we were on the move again tomorrow, and decided to test out his Christian credentials by asking if he knew where the Jonda bus ticket booth was. We needed to buy our tickets there for the next day. He didn’t, but sprang into action, racing off with assurances that he’d be back, as indeed he soon was, together with a Jonda bus official. Result! We bought the last two available tickets, and thanked the Lord! Our second day was an even longer trip, leaving at 5AM, with the bus hold fully packed by 4.30. John did a great job insisting that our bags went in, as some people were travelling with pretty large luggage on their knees. Our lucky-to-get last 2 seats were right at the front, so we had a good view, but got knocked every time someone got on or off, which was frequently, and had lots of excess baggage around our feet. This journey was through much wilder country, mountain scenery, over river bridges, and with stops which were nothing like a service station. The first stop had a long row of smoked fish stalls, and people were buying this to eat on the bus. The fish were from the nearby river, which we crossed soon after by suspension bridge. Passengers got off at random points along the way, which slowed progress considerably. One group of Baptist Women of Zambia (we knew who they were by their skirt wraps which declared their identity proudly) got off near a village, along with what seemed like half the contents of the bus – sacks of maize, cooking pots, clothes, blankets, electrical goods. They were met by men with bikes who valiantly tried to load all the luggage on to take it wherever they were going! We wondered if they had been to Lusaka for a weekend convention, and were coming home with stuff they’d bought in the city. Other people left the bus with goods including a solar battery charger, an electric food warmer, a child’s bike, all fascinating to watch. To cut a very long (12 hour) journey short, we eventually reached Chipatta, had a change of driver, and wended our way to Mfuwe. It was definitely an experience, and one we wouldn’t have missed, as we learnt a lot about Zambian life and how ordinary people travel, as well as watching the villages at the side of the road – women washing clothes in rivers, carrying buckets of water from the well, boys selling mouse kebabs beside the road, traditionally built houses beside more modern ones. I know it was only a superficial snapshot of life, but we saw a huge amount more than on an plane, which for the most part only foreigners can afford. We were the only white people on both buses, but didn’t feel out of place or unwelcome. People were very accepting, some smiled at us encouragingly, and all were helpful if we were a bit bemused by anything. Sounds incredible! We’ve already got the gin in stock for when we can hear your stories first hand.Helen and Chris.